View More In Security & Surveillance. 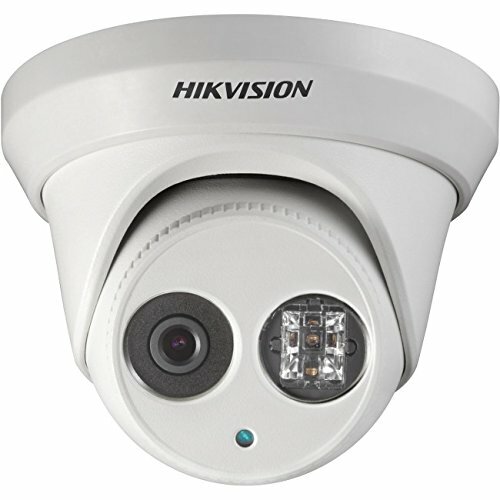 HIKVISION’s DS-2CD2342WD-I outdoor turret camera is an excellent addition to any security system. With its high resolution 4MP sensor, incredible detail is presented in the live and recorded video images. And with the added feature of ROI (region of interest) encoding, you can select exactly what is important to record in the scene and eliminate unneeded video recording, saving significant storage space. Using the latest H.264+ compression technology, provides bandwidth and storage savings of up to 70% compared to H.264 compression. You can be assured recordings will be of superb quality, crisp detail and excellent color rendition. The DS-2CD2342WD-I is designed for 24/7 surveillance in all indoor or outdoor conditions. It operates in temperatures of -22° F to 140° F and is rated IP67, providing protection from inclement weather or even direct water spray while cleaning. This turret camera comes with a built-in 2.8mm fixed lens which provides 106° angle of view. In addition, with its built-in EXIR LED infrared illuminator you can see up to 100 feet at night. The camera includes PoE connectivity and a three-axis mount for multiple types of installations. Multi-layer security features ensure your video is protected. Using HIKVISION recording products with your camera, both NVR’s and DVR’s, ensure end-to-end video encryption. HIKVISION also provides the iVMS-4500 mobile application where you can save live videos or play back on your mobile device with just one click. Included with the camera is our free iVMS-4200 client software. Additional features of camera management, motion and intrusion detection are available with a HIKVISION solution. If you have any questions about this product by Hikvision, contact us by completing and submitting the form below. If you are looking for a specif part number, please include it with your message.